« Podcast #003 – We Saw Iron Man! After picking up my pull from The Source a few weeks ago, I was milling around waiting for Marty when the last issue of the Suburban Glamour miniseries caught my eye. I have to admit, I usually stick to known favorites or hand-picked recommendations from my sister Susie or friends, but this time I just picked up something new and immediately felt like I had stumbled upon a treat- a story about faeries. Not just faeries, but a teenage faerie changling in our world- a girl who never quite fit in and suddenly discovers that she is special. I have read many many variations on this story, it is my ultimate comfort food literature, and even though I am far past the age of pubescent transformation, it still makes me feel giddy and transported. Realizing that the issue said ‘4 of 4’, I resisted reading too much. I searched the store for back issues, but only found #2, so I had the missing issues ordered for me. Last week I picked up the completed arc and immediately devoured them, bumping them in front of my hefty to-read pile. I was not disappointed. I won’t spoil the story, but anyone who shares my love of this genre already knows exactly what happens. The art, by creator Jamie McKelvie, was lovely, the main characters relatable, and the story of a girl having her world turned upside down- comfortingly familiar. This entry was posted by florence	on Thursday, May 1st, 2008 at 8:34 pm and is filed under Image, independent. You can follow any responses to this entry through the RSS 2.0 feed. You can leave a response, or trackback from your own site. I just read this last night (finally), and enjoyed it, even though I felt like there were some non-intuitive jumps in the story. For instance, the last page of the first issue… WTF?!? Anyway, it was fun, and yes, as everyone has said, the characters are portrayed quite well… we all knew people with that same high-school apathetic attitude. 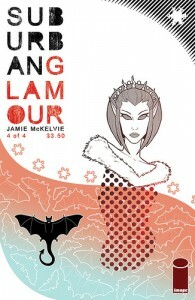 I did some research to figure out what the Suburban Glamour / Phonogram connection is (Jamie McKelvie wrote/drew Suburban Glamour, and just drew Phonogram), and may have to check that out sometime as well.